1 King St. W, Toronto, Ontario | June 7, 2018 | 8:00 a.m. to 4:30 p.m.
See the full agenda here. Sessions are specifically designed for executives, whether you are going through or contemplating a transition, to explore your competitive edge, build relationships with peers, and position yourself for future opportunities. Now is the time to rethink your present and change your future. Registration is now closed for this particular event. Farber, together with its alliance partners, presents the inaugural Executives in Transition Summit. This Summit will bring together and provide a meaningful experience for high-caliber executive talent. Using a holistic approach, by providing the tools for the transition journey, we will delve into topics such as personal branding and networking, the use of social media, and financial and legal planning. Our speakers will also provide an update on market trends, both in the permanent and interim executive space. 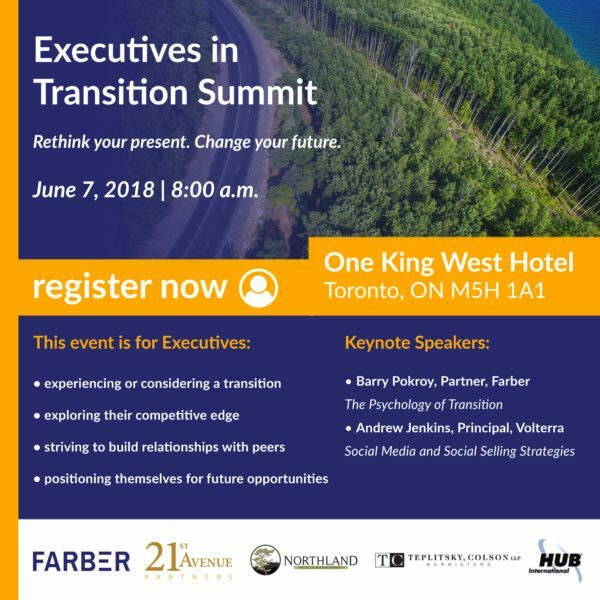 The Executives in Transition Summit is specifically designed for executives, whether you are going through or contemplating a transition, to explore your competitive edge, build relationships with peers, and position yourself for future opportunities. Now is the time to rethink your present and change your future. Session Highlight: Predictive Index – What Drives You? The Predictive Index Behavioral Assessment™ has been designed to be the most effective, simple, and easy to use science-based assessment. It provides an accurate depiction, or pattern, of your core drivers, and therefore insight into your needs and behaviours. In this session, you will gain the insight and perspective needed to develop increased self-awareness and an understanding of what drives your day-to-day behaviours. It will also help you secure a firm grasp of your own management and communication style. You will leave with your own individual and personalized assessment report, along with the tools to create a detailed Personal Action Plan, to help you achieve better communication and productivity in your daily interactions. You will also gain an enhanced ability to identify the right job and culture match as you search for your next opportunity.